‘Three Consonants, One Vowel’ coincides with the 46th NCECA Annual Conference in Seattle, March 28 – March 31, 2012.
a project space is conveniently located between the Washington State Convention Center downtown Seattle and the Seattle Design Center on 1st Ave S. a half block south of S. Holgate. 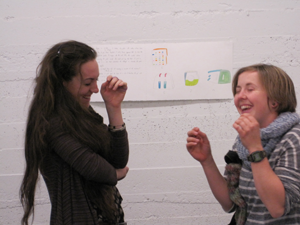 Click here to make arrangements to view ‘Three Consonants, One Vowel’ at a project space Wednesday-Saturday during the NCECA conference. Download the conference program (pdf). The exhibition ‘Three Consonants, One Vowel’ by Brian R. Jones coincides with the 46th NCECA (National Council on Education for the Ceramic Arts) Annual Conference in Seattle. Join a project space in welcoming Brian on Friday, or click here to contact the artist and make arrangements to view the work Wednesday-Saturday during the NCECA conference.